HELP LIBRARY: Comprehensive documentation for Apple?s professional applications. The Final Cut Studio Workflows document has been designed to summarize the overall post-production process and show how the various applications in Final Cut Studio fit into it. This manual also explains how the applications in Final Cut Studio work together, letting you send projects and media from one environment to another to perform specialized tasks. Download FREE Final Cut Pro Alpha transitions, Color looks, and Compressor droplets at no additional charge. Note: Some third party tools already address some of the omissions Mike mentions. Scott Simmons "kicks the tires" on FCP 7 and finds the "good and bad and ugly." Q. Do I really need an Intel Mac to install this? Q. Can I upgrade from any previous version of Final Cut Studio? A. Yes. You can purchase the FCS upgrade for $299.00 and install that if and only if you have a legitimate copy of Final Cut Studio, Final Cut Production Suite or any previous version of Final Cut Pro installed on your Mac. Q. Can I buy the upgrade if I have an NFR or Academic Version of Final Cut? A. Nope. You now need to purchase the full retail version for $999.00. Congratulations. Q. How come the Price for the Full Retail version of FCS went DOWN $300.00 and the Academic Price went UP $200.00? A. We don't know. But the numbers suggest that if you are a Student thinking about purchasing FCS for the first time you might be better off buying the full retail version for $999.00 rather than trying to save $100.00 for the Academic version. You can't upgrade from an Academic version. You can from the retail version. Q. Does a paper manual ship with the NEW Final Cut Studio? A. Nope. Be proud that no trees died for the NEW Final Cut Studio. Q. Is FCP 7 backwards compatible with FCP 6? A. No. You can export a FCP 7 file via XML version 4 and open that in FCP 6. Works just fine. Q. How come it took 2 years for this? A. Because that's how long it took. Q. Is it worth it upgrading to the NEW Final Cut Studio? A. For just $299.00?! Are you kidding me? Q. I really need some of these new features. Should I upgrade now? A. Not if you are in the middle of a project. If you are the conservative sort wait a few months and keep reading what everyone else is saying and THEN upgrade. If you live on the edge then by all means upgrade. Then post on this forum and tell us all about what wonderful and painful things you find. Q. I hear the official name of the NEW Final Cut Studio is just "Final Cut Studio." Won't that be confusing? Please add to this thread links to any helpful web sites on FCS3 including reviews/opinions from end users. This list is by no means complete. I just compared the FCP tech specs on v6.0 and v7.0. - Choose to matchframe to the subclip or to the original clip. changes, multicam clips, and anamorphic media. "Never underestimate a kick to the nuts"
NEW! Along with Marker enhancements, this is huge. Finally, a way to apply multiple dissolves to a range, rather than that weird Drag-Clips-Overwrite-with-Transition technique. Literally huge. I wonder if this includes larger larger Frame views for storyboard editing oon thse 23" and 30" monitors? Nudge a Canvas layer by subpixel with Command-Option-Arrows ! To have a version of your documentation that defaults to all the information being visible, you need to change the source HTML of the files. The short version of the instructions is to rename all instances of "TaskContentBox" to "TaskContentBox-open" in all the .html files in the help system. Here's how to do it using Bare Bones Software's free TextWrangler utility. 2. In the new window that shows the content of FCP, navigate to ?Contents:Resources:English.lproj? 4. Download and install ?Textwrangler? from the Bear Bones website. 11. After a short while 698 of your help files will have been modified. 13. Go to the top level of the ?finalcutpro_help? folder and open the ?index.html? folder in Safari. Whichever section you go to in the help system will default to all the information being visible. AUX TCs were supported by any version of XML. The good news is that FCP7 does handle it in a different way. All former version of XML aware FCPs did overwrite TC information given in an XML by the values which it found in the movie. So if there was no or a different Source, AUX 1 or AUX 2 TC any values from the XML were deleted and replaced by the movie values. This is still the same somehow. BUT if you're sure that there is no Source TC or AUX TC 1 or 2 (which is true for most native captured/transfered media with AUX TC 1 - except RED as they do have two unflagged TCs) FCP will accept the TC information from the XML. With some RED media you may have to use AUX TC 2. Anyway this is one of the coolest features and it took quite a while to convince Apple to implement*. As multi cam and double sound gets more and more popular this makes sync way easier and allows to automate sync (if you you about XML). Most of the things will work fine, but I haven't tried how TC will behave. So be careful with that. very cool tip to make life a bit easier! *) just as an pro for Apple: they do listen. The FCP 7 Manual explains that Shift-dragging a speed keyframe you've set on the SI tickbar drags all trailing speed keyframes in the direction of your adjustment. Shift-Command-dragging restricts the speed adjustment to the left of the speed keyframe you're adjusting. 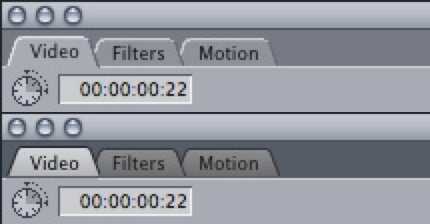 Clip speed on the speed segment to the right of that keyframe remains unchanged. Option-drag a speed keyframe you've set on the SI tickbar and you can use the 2-up display as you slip clip frames under this speed keyframe while its Timeline location remains the same. Thanks Lisa. Yes, Steve did cover them. What he didn't say though is what happens when you do a speed change without rippling the sequence? If you do slomo does the shot get truncated from the end? Which I'm assuming it does? What happens when you speed up a shot? Will it pull frames from the media file outside of the clip? Outside of a subclip? Will it still go to the full media file and add frames in? What happens if there aren't enough frames in media file? FCP7?s Timecode Viewer is straightforward when playing the sequence in the Canvas, it displays the timecode and the name of the sequence playing. 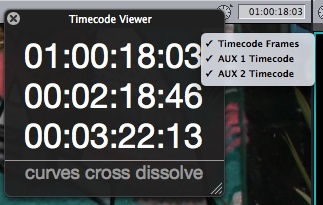 You can choose whether to show timecode with frames (useful when clients insist on changing edits by the frame ? if they can?t see how many frames you?ve moved the edit, they have to review the edit on it?s own merit). You can also show AUX 1 and or AUX 2 timecode. In this case, AUX 1 is running at 50 fps, and AUX 2 represents the audio sync timecode. To change the size of the text, drag the divider between the timecode and the text. In fact more than you would ever want to see unless you have that new Apple 54" monitor. The largest size of icon is too small, but at least they now have the correct aspect ratio. Clips and stills now display correctly. I can ammend that Andreas if you can find out if indeed TC will behave OK. These are great Alex. You need to put all these wonderful mini tutorials you are doing for us in one place. lafcpug will be happy to publish. Course these really should be on your blog first. ... if you can find out if indeed TC will behave OK.
As supposed TCs or Reels created by an XML for version 7 will work fine as long as they 'fill a gap' - but it's only internal FCP metadata, which is cool enough. Exporting those projects/bins/sequences/? to a XML version lower than 5 will still keep this TC info (as said, it had always been there). But importing the XML into any other version of FCP will kill this info as it's always 'file above XML'. I do have 2 custom app's which apply an aux TC to any QT movie even using a FCP XML. Maybe I make them public, but probably not for free. First you need to follow my earlier instructions of how to make all the hidden text visible (see a few posts back), then use Apple's Pages application (from iWork) to combine all the html files together. Instructions are on my blog. If you haven't paid for iWork and your free 30-trial is up, there is an extended method that uses TextEdit as well. If you find Apple's Help Viewer too slow, using your favourite browser will be quicker - although I haven't worked out how to make search work (yet). Is it me, or did the colors in FCP 7 change slightly? The difference between a selected window or tab is now more pronounced. Not sure about the luma level differences between selected and not selected windows, you might be right there; but what is certainly new is that the active tab in a window is highlighted, which it never used to be. The contrast between tabs has been increased: selected ones are brighter, unselected ones are darker. I'm still waiting for FCP to remember which drive a project was assigned to. I would die happy. After upgrading to FCP 7.0.1 via the latest ProApps update, some people have reported clunky playback in Digital Cinema Desktop Preview. In "Library" folder on the Macintosh HD drive go into the "Quicktime" folder. Replace that file with the same file from Final Cut Pro 7.0. Be sure to be logged in as a administrator. or if you've made a disk image (good idea) access that. so right-click on that and "Show Original"
You'll be taken to a folder called "Installer" inside of which is another folder called "Packages"
right-click on it, and "Show Package Contents"
Inside the Contents folder, locate the Archive.paz.gz file. Drag it to the desktop, and double click on it to un-zip it. This will create a folder called "Library"
and there you will find the file "DesktopVideoout.component"
replacing the similarly named file there. Digital Cinema Desktop Preview should now work.